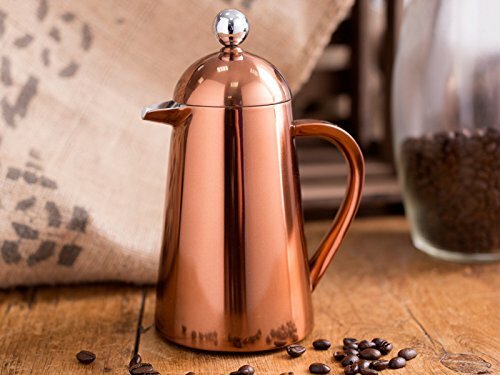 This elegant thermique copper cafetiere from Creative tops is both stylish and bold with its warm reflective copper finish that will make a stunning addition to any cafe or copper themed home. The copper coated stainless steel body is double walled keeping the outside of the cafetiere cool while the coffee inside remains hot for up to 3 times longer than conventional cafetieres. 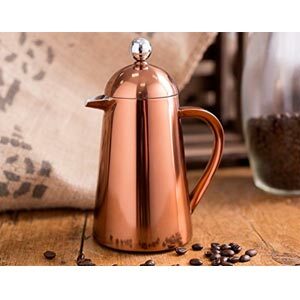 Capable of holding 350 ml (12 fl oz) this copper cafetiere is great for serving up to 3 cups of coffee and is as functional as it is stylish. The copper coloured cafetiere includes a stainless steel plunger ideal for making hot fresh top quality cafe style coffee in an instant.